3Rs Remedial Teaching Programme is to provide Remedial Teaching or Supplementary Teaching for low grade students and to enhance the achievement levels of students who are lagging behind in their Academic Standards related to their class specific age. Remedial Teaching is a 45 days programme which will be completed in 45 working days. In this programmes Pre Test /Baseline Test and Post Test/ End line test(evaluation) would be conducted as per schedule. Baseline Test/Pre Test for Seat target to make all the students to achieve and it is conducting through diagnostic form to students. 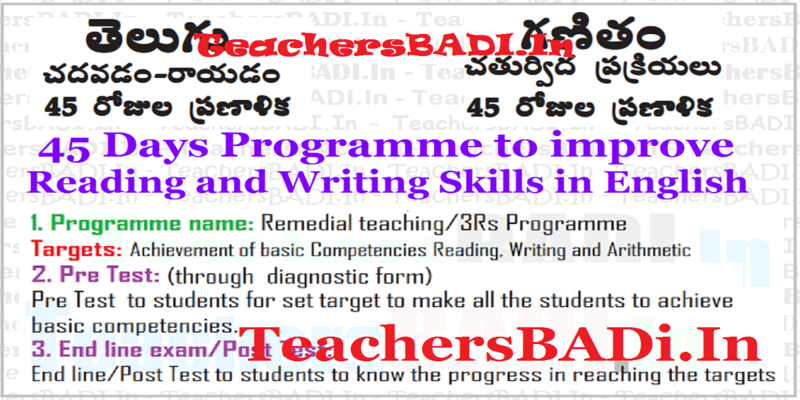 Remedial teaching (3Rs Programme) for Children Basic Competencies Achievement in Reading Writing Arithmetic. 3Rs meaning is Reading Writing Arithmetic Competencies Improvement Programme. Remedial teaching (3Rs Programme) to be Implemented in all the Primary, Upper Primary and High Schools. ♦ to be able to read and write simple sentences. ♦ to be able to read and understand the given text. ♦ to be able to respond to the given questions. ♦ to be able to read without inhibitions. ♦ to be able to write legibly. ♦ to be able to converse in day to day context. ♦ Have faith in yourself as well as in your child. ♦ Grow and let your children grow. ♦ Mistakes are a sign of learning. ♦ Every child has its own pace. ♦ Create a friendly atmosphere in the class. ♦ follow the schedule accordingly. Day 2 ♦ Write each word uttering clearly. ♦ Ask some of the children to read the words. ♦ Ask them what the persons are doing in the picture. Day 3 ♦ Ask them to sequence the sentences. ♦ Don’t correct the errors on the spot. ♦ Edit the passage with the help of children at the end. ♦ Ask them to give a suitable title for the passage. Day 4 ♦ Divide the class into 4/5 groups and give each group a picture. ♦ Ask them to observe, discuss and group leader writes the sentences with the help of others. ♦ Ask each group to present their version. Day 5 ♦ Teacher should write his own version and present it in the class. ♦ Ask the students to compare their version with their teacher’s version. ♦ Children have to edit their own version with help of other groups / teacher. Day 6 ♦ Every child has to draw a picture, describe it and present it. Day 7 ♦ Take the same picture of day 1. ♦ Identify two characters in the picture. ♦ Ask the children what they are talking about. ♦ Write 4/5 exchange as they say. Day 9 ♦ Ask the children to write 4/5 exchange of conversation on their own picture (individual activity) and present it. Day 10 ♦ Editing the conversation. ♦ Rewrite and present it in the class. Day 11 ♦ Divide the class into 4/5 groups. ♦ Ask each group to select a picture from any text book. ♦ Ask them to observe, discuss and describe the picture. ♦ The group leader writes the sentences. ♦ Each member should give atleast one sentences. Day 12 ♦ Following the above method, ask them to write a conversation. ♦ Ask them to write a description and present it. ♦ Select one / two and edit with help of students. Day 14 ♦ Ask them to create a conversation of at least 4 exchanges on the same picture. Follow the same steps as shown above. ♦ Take a picture and stick on a wall. ♦ Ask the students to write a description & a conversation. Day 17 ♦ Language game related to reading and writing puzzle, word building, memory game... etc. ♦ Generate same sentences through the words. ♦ Give some questions to test their comprehension. ♦ Every individual should write the answers. Day 19 ♦ Select a poem and do the same. Day 20 ♦ Select a passage and ask them to list out the three letter words read & write. Day 21 ♦ Select a passage and ask them to list out the four letter words read & write. Day 22 ♦ Select a passage and ask them to read and separate persons and places. Day 24 ♦ Select a passage and ask them to read and list out the action words (Verbs). Day 25 ♦ Supply the students with a story / an article and ask them to read, and understand it. Ask him to give a suitable title to it. ♦ Ask them to collect some authentic material like the pictures of sports persons / Leaders / Actors / Movies.... etc. ♦ Ask them to write a few sentences & present it. ♦ Ask them to write a few sentences about the movie / actor and present it. ♦ Ask them to write as many words as possible and write 5 sentences using the words they wrote. ♦ Giving a passage with same spelling mistakes and ask them to rewrite it by correcting the spelling mistakes. ♦ Ask them to write some slogans and present them. ♦ Give / Create a text ( a passage) and ask them to prepare and present an poster. ♦ Give / Create a situation and ask them to prepare and present on invitation card. ♦ Take a picture (Thought provoking / a news paper) and display it. Interact with the children about the picture. Ask them to write a letter to a friend / a news paper editor describing the picture and present it. ♦ Edit the letter after presentation and teacher should present his own version. ♦ Ask the children to write the spelling of the number from 1 to 100 & months from January to December & Sunday to Saturday. ♦ Edit them then and there. ♦ Teacher should also read aloud. ♦ Divide the class into two groups. Give each group a story / a passage and ask them to prepare some questions for the other group. They answer it. ♦ Editing - Teacher should support in framing questions. ♦ Teacher should concentrate on ‘ do ‘ forms and ‘have’ forms.